The Chinese culture is known for its festive banquets, particularly for weddings and Chinese New Year's celebrations, and crispy Peking duck. 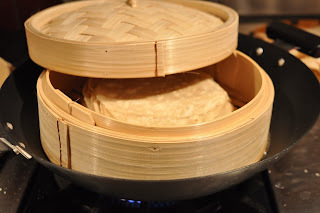 Cooking Peking duck at home is fun but also quite time consuming. I found this recipe to be relatively easy to follow and strongly suggest it's worth the try. 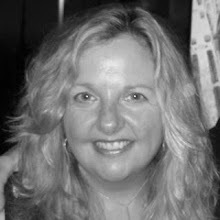 January 23, 2012 marks the new year so out with the "year of the rabbit" and in with the dragon. 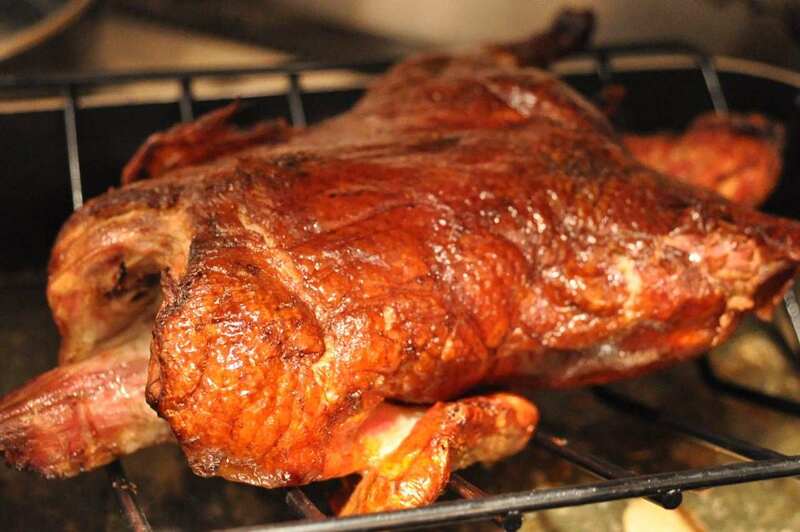 The key to good Peking duck is the many-stage and all-day process of drying the skin, removing excess fat and glazing the bird with aromatic ingredients so that the roasted bird is crispy on the outside, lean, not greasy, and very moist on the inside. 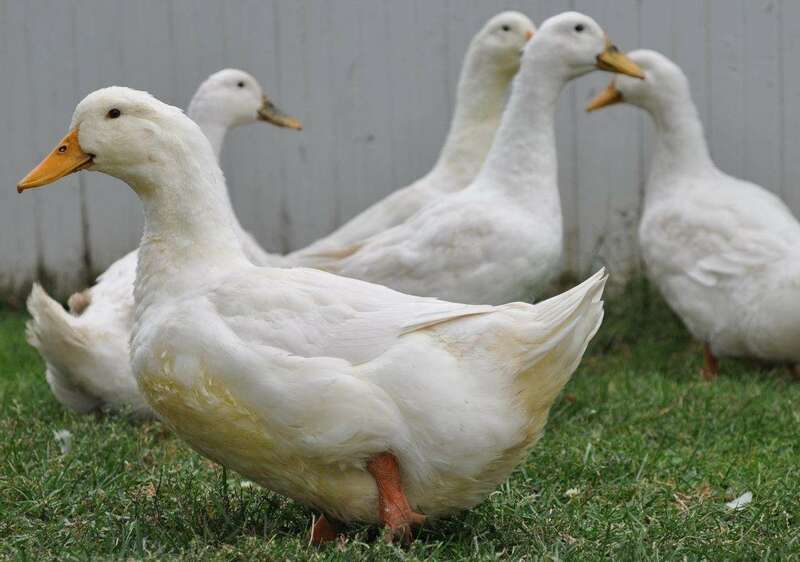 Choose fresh -- never frozen -- Long Island duckling, whenever possible. And start cooking the night before or early in the morning to allow the skin to dry out before cooking. Drying the skin is step one. Hang it using a string wrapped under its wings and over a kitchen cabinet knob and use a fan to speed up the process. 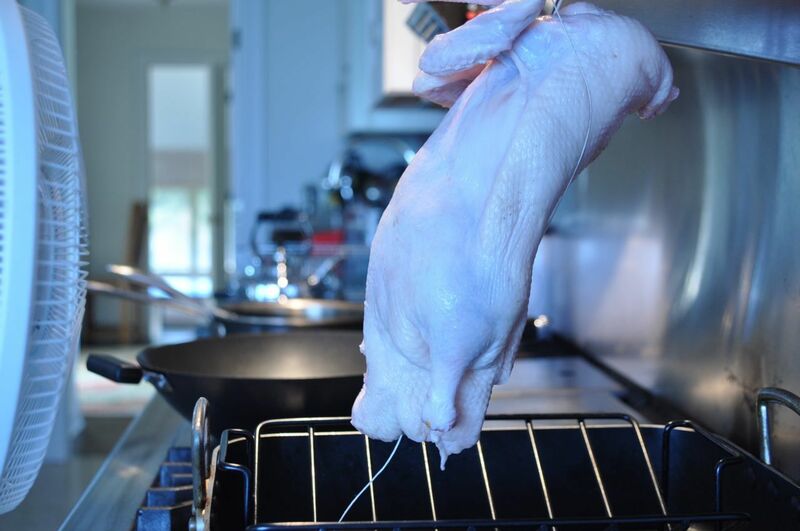 While the duck is drying, you can go shopping for fresh vegetables to serve. I like to mix green and purple scallions, and serve a side dish such as bok choy. A 5-minute bath in a honey glaze is step two. Lower the duck into the wok so as not to splash the hot liquid. Step three is drying the freshly glazed skin again using the same method as step one. The Time-Life recipe calls for one hour in front of a fan at this stage; however, I followed other recipes that called for longer drying times (the drier the skin the crispier the duck). 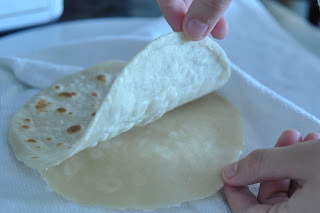 Two flour-water pancakes made with a cookie cutter are brushed with sesame oil, stacked and rolled again, cooked in a hot pan for two minutes and then separated. It is fun to peel the pancakes apart. When I have it, I use beach plum jam instead of hoisin sauce although store-bought hoisin works equally well. About 2-1/2 hours before you plan to serve dinner, and when the skin is dry like “parchment paper”, roast the duck. As detailed in the recipe below and shown in the top photograph, the duck is plated on a serving dish, separating the various parts and serving on different plates (crispy skin, legs, breast meat). 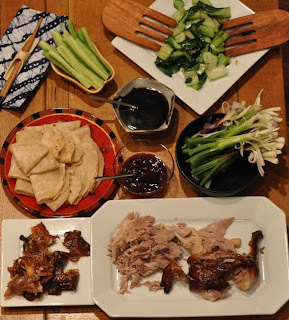 To serve, diners take a pancake, brush on hoisin or beach plum jam sauce using a scallion that's been cut to make a "paint brush", put duck meat and skin on top on top of the pancake, and then roll it up with the ingredients inside. Then, take a heavenly bite. The dragon is a symbol of power and wealth. 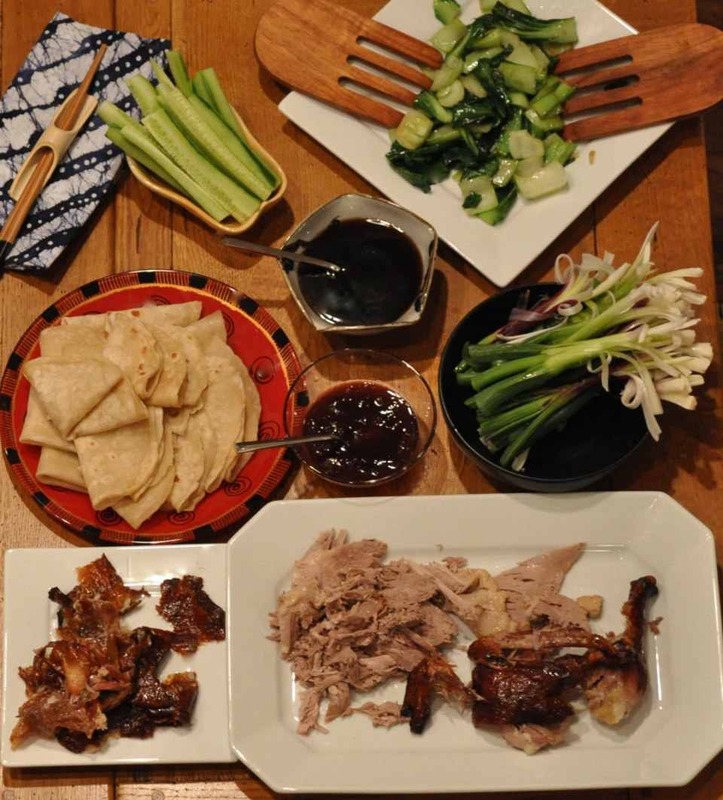 What could be better than a meal fit for an emperor -- Peking Duck? Wash duck. Wipe dry and tie string under wings. Hang in a cool place in front of an osillating fan for 2 hours. Fill a large wok with bath ingredients. Stir and boil. 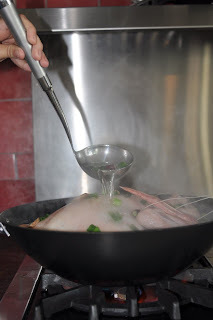 Lower duck into the boiling liquid and ladle liquid over duck to moisten all sides (continue for 5 minutes). Hang duck again and fan for 3-6 more hours. Preheat oven to 375 degrees. Place duck breast side up on rack in a roasting pan filled with 1 inch of water. Roast for one hour. Lower to 300 degrees (F), turn duck breast side down and roast 30 minutes. Turn breast side up again, roast 30 minutes until internal temperature reaches 180 degrees. Let sit on top of the stove for 15 minutes before carving. Using a sharp knife cut off crispy skin, carve legs and wings from the bird and slice the meat. Cut the skin into neat bite size pieces and the meat. Serve skin, legs and wings, and duck meat on separate serving platters. Brush sauce onto pancake using scallion brush, add duck, some crispy skin, and scallion garnish. Roll pancake like a taco and eat. Serves 4. Beverage Pairing: Serve with red or white wine: white Riesling or red Pinot Noir. Long Island has some great wines to pair with the Long Island duck. Heat until bubbling and let cool: ½ cup of beach plum jam, 1 tablespoon of local honey, 1 tablespoon of brown rice vinegar, ½ tablespoon of grated ginger root and ¼ teaspoon of Thai pepper. For a video and tasty recipe, check out Videojug’s How to Make Chinese Pancakes. 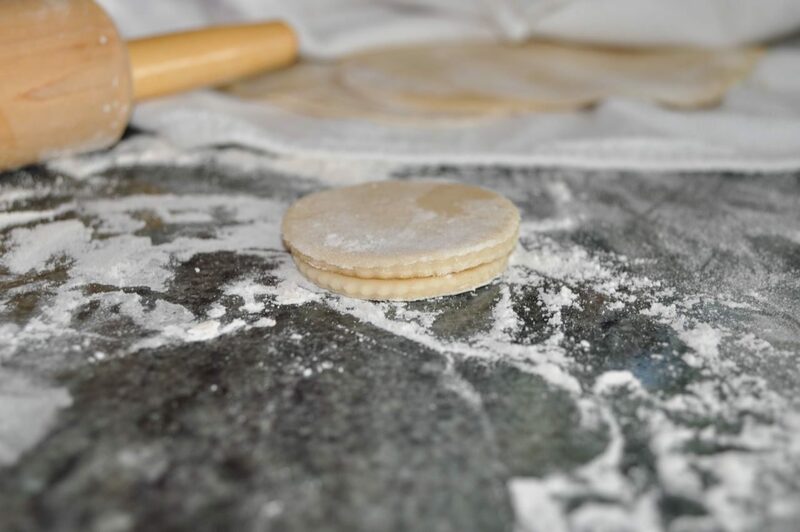 You’ll need flour, water, sesame oil, sugar and a few special tools, including a rolling pin, cookie cutter and stop watch. Pancakes can be made ahead and steamed right before serving. Crescent Farms: Of literally hundreds of Long Island duck farms from the 1930’s and 1940’s on Long Island, only two remain. Paumanok Preserves and a few other local jam and jelly entrepreneurs make jam with local beach plums. Beach plums are native to Long Island and Cape Cod.